What the ANC needs to do to show it means business is to wield the hatchet against one of its own. Otherwise three days of big talk and introspection at its national general council (NGC) will come to naught. 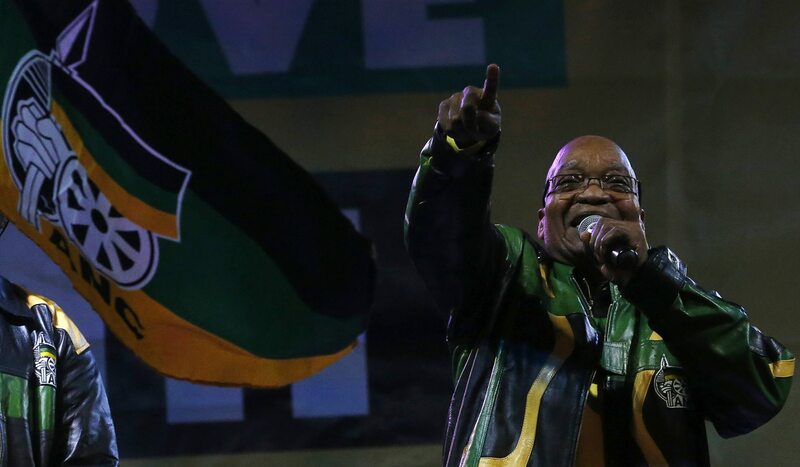 President Jacob Zuma hit the panic button on Friday – the ANC had lost over a third of its members in three years, traditional supporters were turning away and corruption had severely damaged the party’s image. The NGC’s comeback strategy includes giving a group of veterans the mammoth responsibility of doing what the current leadership cannot do – clean out the rot. And from the ICC to the media, the ANC is on the attack. By RANJENI MUNUSAMY. And thanks to a doorstop question by a Mail & Guardian reporter, we know that President Jacob Zuma said he will “never ever” stand for a third term as ANC leader. “Even if they beg me I won’t stand,” Zuma said. But before you think this is set in stone, consider these comments Zuma made in 2011 when reminded that, three years before then, he said: “I would prefer to leave after one term. “I never said I would serve one term and I have never said that I would want two terms. I said a second term is a decision of the ANC but people twist it now. I have never defied the ANC. If the ANC said serve one term, that will be fine. I am a cadre of the ANC,” Zuma said a year before he ran for a second term. Whether he is preparing for retirement or will change his mind if some ANC structures decide to nominate him for a third term in 2017 remains to be seen. But what Zuma has done is hand over responsibility for much of what has gone wrong under his presidency of the ANC and government to the membership of the party. In his opening address, Zuma said the NGC needed to undertake a frank assessment of the state of the organisation and identify those issues that make its traditional support base unhappy. He raised the issue of negative perceptions of the party, lack of discipline, the prevalence of factions, corruption and identified “kingmakers” as being alien to the ANC. Zuma seemed to see no irony in raising all these issues without considering his own role and contribution to all these perceptions. One could argue that as leader of the party, it was Zuma’s responsibility, together with the national executive committee (NEC) elected in 2012, to deal with all these problems. As a midterm review, the NGC was assessing the implementation of policy since 2012, so any failures should be attributed to the elected leadership. The overwhelming assessment of the NGC commissions was that things have gone horribly wrong both in the ANC and government. From the 37% drop in membership from over 1.2 million in 2012 to 769,870 now, to the slow implementation of the National Development Plan, lack of capacity in the state, instability in state owned enterprises and high levels of crime and corruption, there are clearly serious problems. Strangely though, nobody is being held responsible. With regard to the corruption and moral degradation infesting the ANC, the buck has been passed to an integrity commission announced by the NEC in March 2013. The establishment of the integrity commission is another resolution of the 2012 Mangaung conference that never quite got off the ground. The ANC now wants the integrity commission to clean up its image by investigating people who bring the party into disrepute and make binding recommendations about actions against them. This includes getting people accused of criminal activity to step down from positions in the ANC. In recent years, a number of ANC leaders accused of corruption, including the president, have hung onto their positions by claiming they were innocent until proven otherwise. ANC NEC member Nomvula Mokonyane said at an NGC media briefing that the integrity commission would make decisions in the interests of the party, irrespective of court decisions. What this means is that even if a person is found not guilty, the commission could still recommend they step down because of the damage they cause to the ANC. Mokonyane said the integrity commission was made up of people whose record was not questionable and therefore they should be given the authority to make binding decisions. To say their credentials are unquestionable is somewhat of an understatement. Despite their long histories of service to the ANC and the country, and the fact that most of the members are well into their retirement, the ANC now wants this commission to do investigations into criminal activity and misconduct of its members, and make decisions on their fate. While the ANC definitely needs moral guidance, it speaks volumes that it has to rely on its golden generation of leaders to step forward to help rescue the party. Mokonyane did not answer whether the integrity commission could act retrospectively against people who had already brought the party into disrepute. The image clean up mission includes better communications and more positive media coverage. But the method of achieving this is somewhat absurd. The NGC decided to reintroduce the idea of a media appeals tribunal by getting Parliament to investigate its “feasibility and desirability” as part of a package to ensure transformation and accountability in the media. But ANC NEC member Lindiwe Zulu also revealed the underlying justification for the media appeals tribunal. She told an NGC media briefing “a lot of what is reported is on the side of the negative”. The logic therefore seems to be that the media appeals tribunal can be used as a weapon against a critical media to ensure a more positive orientation rather than to ensure accuracy and penalties for false reporting. The fact that the introduction of the tribunal would provoke greater negative perceptions of the country with curbs on a free press were apparently not taken into account. However, it is difficult to escape from the fact that South Africa’s legal quandary with the ICC was brought on by the fact that it allowed Sudanese President Omar Al-Bashir to enter and then leave the country, flouting a warrant for his arrest for war crimes. If the decision to withdraw from the ICC were made in principle without the Al-Bashir fiasco having taken place, perhaps perception would have been different. The NGC took place in the context of the ANC being under siege from inside and out. A battle for its soul is raging internally, which is why it is clamping down on factionalism and lobby groups with a decision to make these disciplinary offences. It remains to be seen whether this will have any effect on dismantling factions, including the much-talked-about (and now much-denied) “premier league”. After years of ignoring warnings that its image is taking a battering by protecting people accused of corruption and inappropriate conduct, the ANC is now counting the costs. And that cost is evident in actual numbers of members and votes lost. The ANC also realises that it is in serious danger of further losses in next year’s local government elections, and is therefore making strategy changes. This includes unveiling its mayoral candidates in contested metros beforehand to be the face of their election campaigns. Of course all these big decisions could fall down on implementation, as so many have in the past. By its own admission, the ANC is extremely weak in implementation in party and government policies. The best way to demonstrate a turnaround is through decisive action. Instead of continuous talk about cleaning up its ranks of corrupt elements, the ANC needs to make an example of somebody – preferably a big fish. Zuma said in his closing address that the ANC hoped to win back its lost members and that all 1.3 million names in its database should be confirmed as members in good standing by 2017. Photo: South African President Jacob Zuma dances at the victory rally of his ruling African National Congress (ANC) party in Johannesburg May 10, 2014. REUTERS/Mike Hutchings.